There was a great independent film released a few years ago called Take Shelter, in which a simple, hard-working family man in Ohio begins having horrific, recurring nightmares. All of the dreams, which are the most realistic I’ve ever seen on film, contain the same hallmarks – an atmosphere of uneasy tension, the approach of a thunderstorm, a deluge of rain that seems thicker than normal, and the appearance of an unexpected menace. In the film, those dreams are trying to tell him something (I won’t say what). 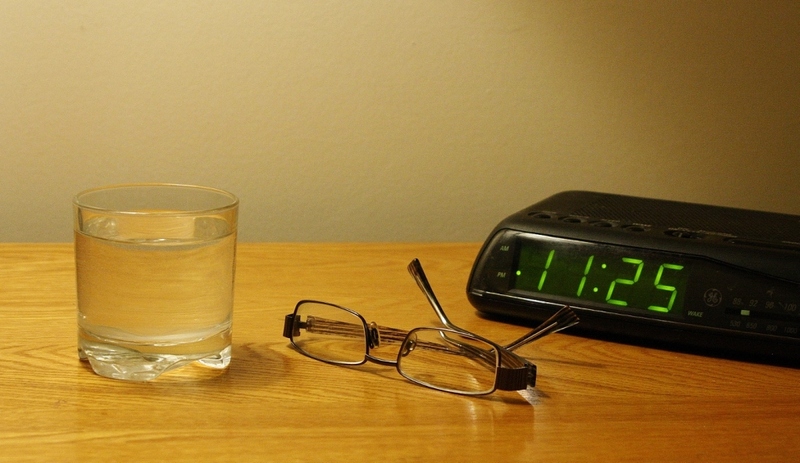 In our own lives, theorists tell us that recurring dreams are our mind’s way of telling us something about ourselves, and are often caused by a psychological trigger. 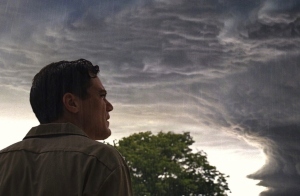 Michael Shannon in a scene from Take Shelter. Sure, it’s common for illnesses like anxiety and Post-Traumatic Stress Disorder to trigger such dreams, but could something as benign as selling a car lead to Slumberland disturbances? I say it can, because it happened to me. After trading in my old ’94 Camry in 2008, that same car appeared in my dreams for years on end. Unremarkable dreams, sure, and ones that gradually diminished in frequency over time, but it was still something. The dreams were simple. No matter what car I was presently driving, I would wake up to find that my old Camry had returned sometime during the night and was again vying for my driving affection. I would then scramble to make arrangements to house my returning friend. I loved that car. It took me anywhere and everywhere, competently and without drama or mishap. 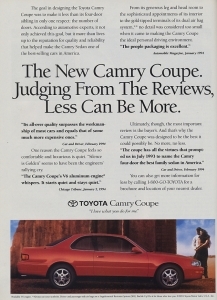 I firmly believe that era of Toyota Camry – 1992 to 1996 – was the pinnacle of bulletproof Japanese quality. Built like a bank vault, oozing quality, that car never once left me stranded, never burned oil or required engine or transmission work, and still ran fine with 420,000 kilometres on the odometer. It drove me to Newfoundland and the south coast of Labrador , and shrugged off impacts with two deer over its lifetime, suffering next to no damage. Even on the harshest sub-zero mornings in Ottawa, the aging battery (which had been replaced only once, at 91,000 km) turned over the engine without hesitation. Oh, and it was rare, too. Beige, yes, but rare. Somehow I had managed to find a 2-door model with a 5-speed manual transmission bolted to the base 2.2-litre four-cylinder, which made for a fun, economy-minded Japanese rig. I could go on and on (oh yes!) – about the roominess, the fold-down armrest in the rear, the wonderful placement of the ignition in the dash, the high-quality upholstery – but you get the picture. Oh, it’s MORE, baby! Could the ’92-96 Camry be the most rock-solid midsize ever? Eventually, the list of non-drivetrain fixes that needed to be performed to keep the car on the road became too long. I was starting a new job that required a daily driver, and the psychological impact of the extremely high mileage on the odometer worried me. Forget range anxiety – this car was starting to give me lifespan anxiety! So, it went to the wreckers shortly after the trade-in. And I felt bad about that. Worse, I felt guilty, like I had betrayed a loyal, trusted friend. I had taken it out behind the barn while its little 2.2-litre heart was still beating (and not burning a drop of oil, either). Guilt, regret, sorrow – all of those emotions compelled the Camry to return to me in my dream state. It’s been about a year since the last time it happened, and I credit a frenzied January search for a worthy buyer of my last vehicle (rather than trading it in) for making the dreams cease. After years of thinking my Camry guilt was outside of the realm of normal, a confession by two car-loving friends made me realize my experience wasn’t so unusual. For one friend, it was a childhood car that kept coming back in his dreams; for the other, it was a car frequently borrowed as an adolescent that “got away” before it could be owned. I felt pretty normal after that, and began to wonder – what was the frequency of car-related dreams amongst drivers? I don’t have the funding to perform a survey, so we can only guess. 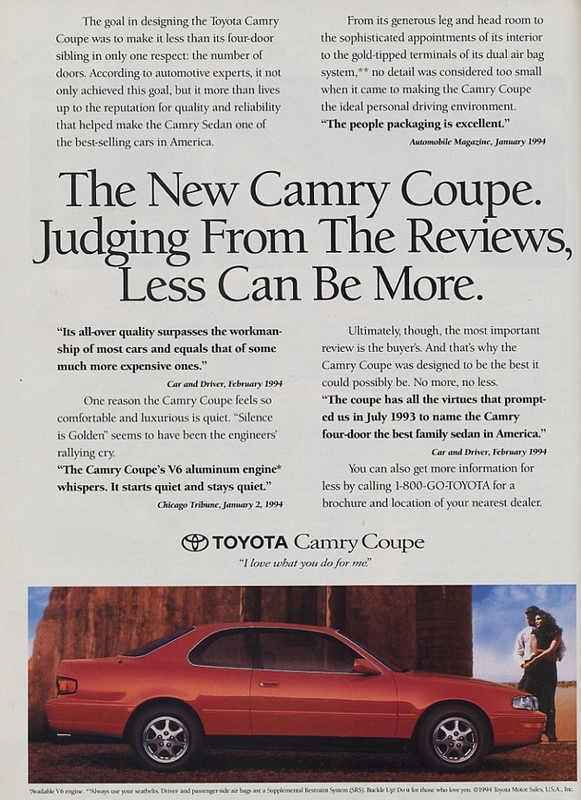 I also wonder when Toyota will bring back the 2-door Camry, so that me and (maybe) three other drivers can buy one. How about it, huh? This entry was posted in Musings and tagged Camry, Toyota on December 19, 2014 by Steph Willems.